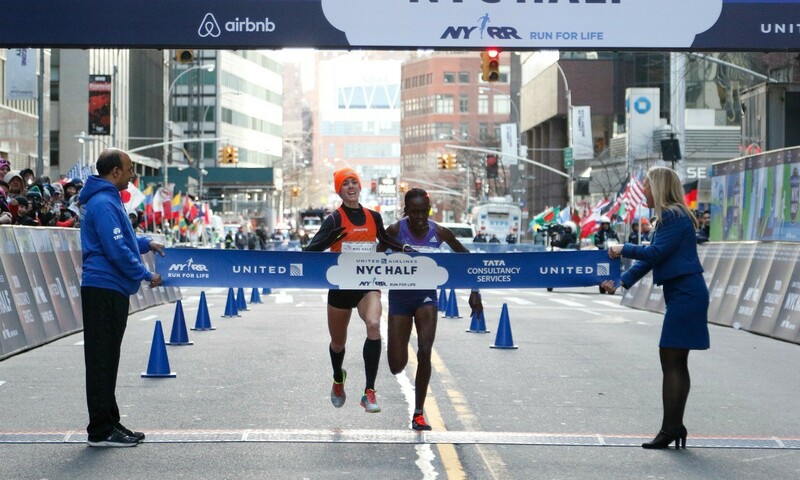 At the United Airlines NYC Half there was a terrific finish in the women’s race between Molly Huddle and Joyce Chepkirui, with the pair separated by only eight-hundredths of a second. Huddle prevailed to become the first woman to win back-to-back titles in this race in a course record of 67:41, the same time as Chepkirui. Burundi’s Diane Nukuri was a distant third in 69:41, with Ireland’s Fionnuala McCormack the top European finisher in fourth in 70:44. Boston Marathon winner Caroline Rotich was fifth in 70:45. Stephen Sambu (61:16) and Wilson Chebet (61:35) took a Kenyan one-two in the men’s race with former Kenyan Sam Chelanga the top American in third in 61:43. Britain’s Lee Merrien ran a PB of 64:07 for 14th. Seven-time Paralympic medallist Ernst Van Dyk and 11-time Paralympic medallist Tatyana McFadden smashed the course records in the men’s and women’s wheelchair races respectively. Van Dyk captured the title in 47:37, while McFadden got the win in 52:25. Report with help from organisers NYRR. British athletes claimed a wheelchair race double at the Lisbon Half Marathon, with six-time Paralympic champion David Weir winning the men’s race in 42:23 for his quickest time over 13.1 miles in seven years. It was a 1-2 for British athletes as Simon Lawson was second in 43:55. Shelly Woods won the women’s race in 49:49 to beat her fellow Briton Jade Jones by one second as both athletes clocked PBs. Ethiopian athletes took a one-two in the women’s race courtesy of Ruti Aga (69:16) and Wude Ayalew (69:23), with former world 10,000m champion Linet Masai third (69:33). Bahrain’s Eunice Chumba also broke the 70-minute mark in 69:55 while Sara Moreira was the top European on home soil in fifth in 70:17 ahead of Clemence Calvin (71:17) and Jelena Prokopcuka (71:44). Kenyan runners dominated the men’s race with Sammy Kitwara taking the win in 59:47 ahead of Kenneth Kipkemoi (60:05), Paul Lonyangata (60:11) and Emmanuel Kipsang (60:14). Local runner Liu Ruihuan cut more than two minutes off her personal best to take the women’s title in 2:26:13, while Ethiopian teenager Kelkile Gezahegn Woldaregay had a surprise win in the men’s race in 2:10:54 at the Chongqing International Marathon, reports IAAF. The 22-year-old Hua Shaoqing, also from China, beat her PB of 2:30:58 to take the second place in 2:29:15, while former Beijing marathon winner Zhang Yingying, the fastest woman on paper with a best of 2:22:38, came home 40 seconds later to complete a clean sweep of the podium for China. Wilson Loyanae retained his Seoul Marathon title in a PB of 2:05:13 ahead of Evans Kiplagat (2:05:33). Mike Kigen recently transferred from Kenya to Turkey and gained the European record with 2:06:10 to break Benoit Zwierzchiewski’s long-standing 2:06:36 mark. Tadesse Abraham was an excellent fourth in a Swiss record of 2:06:40 with Frankline Chepkwony fifth in 2:06:51. Former world record-holder Patrick Makau was a DNF due to illness. Rose Chelimo made a Kenyan double in the women’s race in 2:24:14 with Ethiopia’s Melkaw Gizaw (2:24:28) and Kenya’s Agnes Jeruto (2:24:59) also breaking 2:25. In a very fast men’s race with three runners breaking the one-hour mark for the half-marathon, Kenyans Geoffrey Yegon (59:44) and Kenneth Keter (59:48) took first and second, with former world junior 10,000m champion Yigrem Demelash from Ethiopia third (59:49). Parendis Lekapana led a Kenyan clean sweep in the women’s race in 70:34 ahead of Winny Jepkorir (71:27) and Ivy Kibet (72:19), with Elizeba Cherono – who recently gained Dutch citizenship – fourth in 72:42. Kenyan runners filled the top six spots in the men’s race and the top four spots in the women’s race at the Stramilano. James Wangari motored to a runaway win in a fast time of 59:12 to break Paul Tergat’s 18-year-old course record by five seconds. Paul Mwangi (61:31) and Amos Kibiwot (61:56) filled the remaining spots while last year’s winner Thomas Lokomwa placed sixth in 63:12. Rael Kiyara won the women’s race in 70:19 ahead of Viola Jelagat (71:03) and Hellen Jepkurgat (71:34). Top Italian finishers were Yassine Rachik (63:56) and Catherine Bertone (74:18).